Have you lost your IPCC/Intermediate registration letter after your IPCC/CA Intermediate registration or you haven’t received it yet? If yes, then don’t worry we are suggesting you the way through which you can download your CA IPCC registration letter online and this is free of Cost. Institute of Chartered Accountants have provided the facility of downloading CA IPCC registration letter online through its online portal. Through this window, you can download CPT, IPCC, CA Final, Articleship and many other registration letters. A registration form is available on the ICAI official portal. Click on the below given link to directly land on that page from where you can download the registration form. Further, you have to select your registration letter (CPT, Foundation, IPCC, intermediate, Conversion from Old to New Scheme, Articleship, CA Final etc). Thereafter, you need to mention your registration number i.e. CRO, NRO etc. After that, mention your DOB. Re-write the captcha and click on the submit button. Your registration form will appear on your desktop after clicking on the Submit button. Either save it to your PC or print it for the further reference. 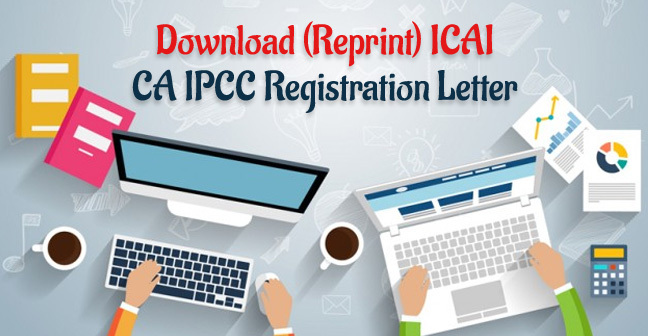 It is important to have an IPCC registration letter for further reference. It is useful at the time of IT and OP program registration as well as IPCC exam application time. In the previous article, we have also given the IPCC amendments applicable for May 2019 Examinations. Apart from this, you can also download the IPCC Study Material & Practice Manual, Revisionary Test Paper(RTP) and Mock Test Papers (MTP) applicable for May 2019 Exams. Article: Completion of Articled service Training. Re-registration of the service as an articled clerk. Article: Registration as an Articled Assistant under Direct Entry Scheme/ Transition Scheme of Intermediate (Integrated Professional Competence Course). Article: Registration as articled assistant and for CA Final Course New Scheme. Article: Registration as Articled Assistant for Group 1 Passed. Article: Termination of article assistant service article : Termination of Articled Service. BOS : Registration for CA Final Course (New). CPT: Registration for Common Proficiency Test (CPT). Firm: Joining as Paid Assistant. Firm: Leaving as a Partner. IPCC: Confirmation of your Provisional Registration in Intermediate (Integrated Professional Competence Course) - under Direct Entry Scheme. IPCC - ATC : Acknowledgement Letter for Payment of Fees (IPCC- ATC). IPCC-CON : Acknowledgement Letter for Payment of Fees (IPCC-CON). IPCC-ORI: Acknowledgement Letter for Payment of Fees (IPCC - ORI). IPCC: Registration for Integrated Professional Competence Course. Member (COP) : Admission as a Fellow Member. Member : Acknowledgement Letter for payment of Fees (Existing Member). Member: Acknowledgement Letter for Payment of Fees - New Member. Member: Acknowledgement Letter for Payment of Fees - Online payment. Member: Acknowledgement Letter for Payment of Fees (FECMU). Member: Acknowledgement Letter for Payment of Fees (MFAD). Member: Admission as a Fellow member without Certificate of Practice (COP). Member: Enrollment in the Registration of Members without Certificate of Practice. Member: Granted Certificate of Practice. Member: Granted Certificate of Practice with Employment. Member: Granted Certificate of Practice with Paid Assistance.